We’re nearing the four year mark of buying our beloved fixer upper after downsizing from twice the square footage and property. The years have flown here, maybe because there always seems to be another project on the horizon or another son moving home temporarily, or because (and this is the most likely), these renovators are getting old so time passes quickly! 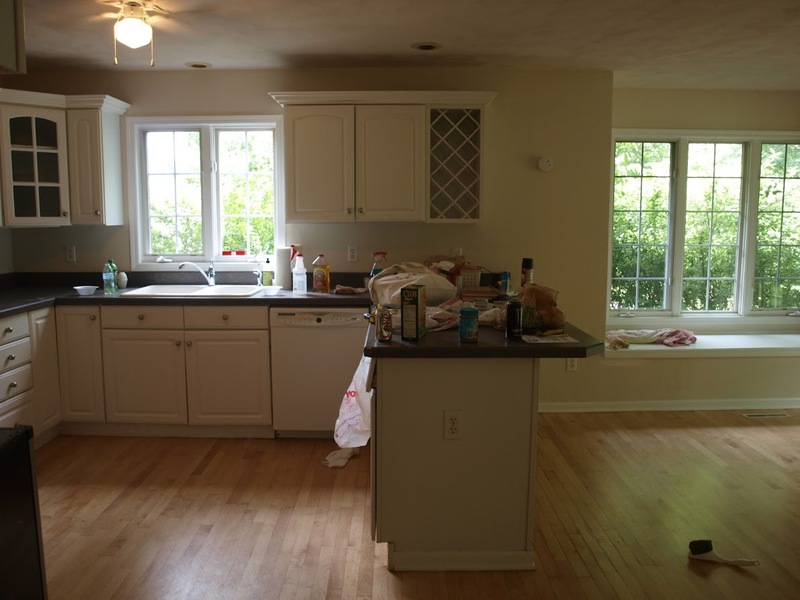 Before & After: European Country Style Fixer Upper is a peek at the DIY transformations of our work here as renovators. Hello Lovely Studio. The breakfast area of the kitchen with new white oak hardwood floors, a newly plastered ceiling, and new baseboard trim. 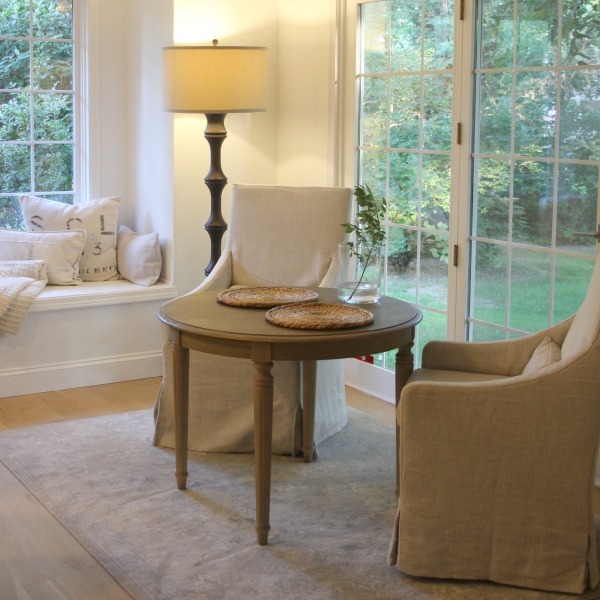 Chairs: Belgian linen (sand), RH. Table: RH. Placemats: FIND HERE. Rug: Homegoods. Candleholders: FIND HERE. Before & After: European Country Style Fixer Upper…photos of our cottage renovation as well as shopping resources to get the look. French Nordic cottage style and European farmhouse decor ideas…certainly lovely indeed. We have done the renovation entirely ourselves, with the exception of the hardwood flooring, new HVAC, new windows, and new roof. Hope you enjoy seeing how far we have come! This place did not look exceedingly horrible in photos when we saw it online. It was owned by the bank as a foreclosure property, and to keep their costs low, they installed cheap taupe carpet (without replacing pet soiled carpet padding), spray painted all the hardware and faucets white, and painted the walls yellowed antique white. There were critters living in the attic, a shower/bathtub leaking into the electrical box below, water damage underneath subfloors, and a jungle of weeds for a view. Hello Lovely Studio. 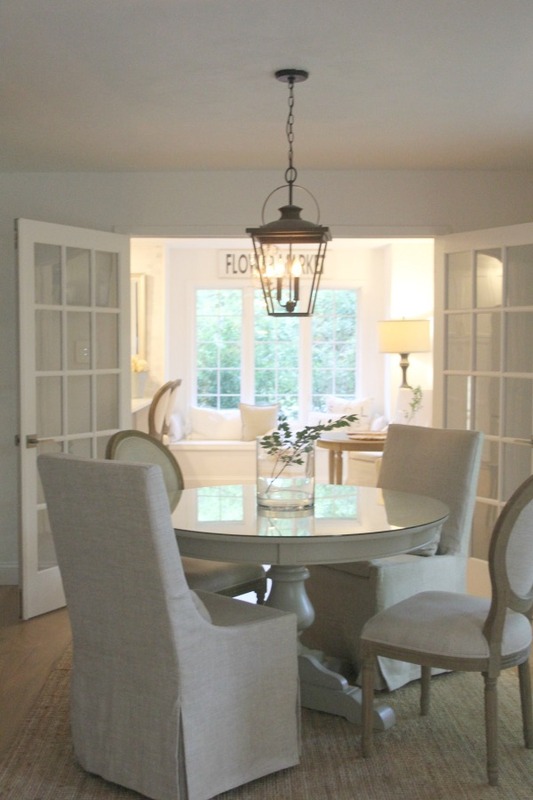 The dining room is between the kitchen and great room and used to have a narrow opening which we widened, adding vintage French doors I found locally. Dining chairs: FIND HERE. Paint color on pedestal table: BEHR Garden Wall. Rug: FIND HERE. Chairs: RH. Lantern: Home Depot. We Had Seen it Years Earlier! One slight advantage we held in entering this mess of a project? 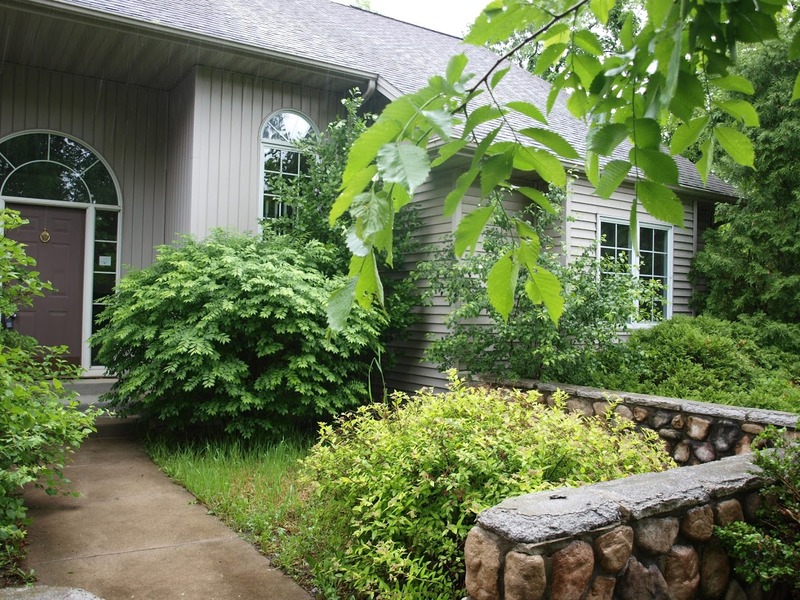 We toured the property 12 years earlier when it was on the market at a time it had been cared for inside and out. The gardens were lush and beautiful, and the interiors were lovingly cherished. At that time, the home was not only too expensive, its floor plan did not make sense for our young family. This time around in its forlorn, neglected state, we had no competition for this home! Not even the neighbors wanted anything to do with it since they watched it decline over the years with a steady stream of renters. 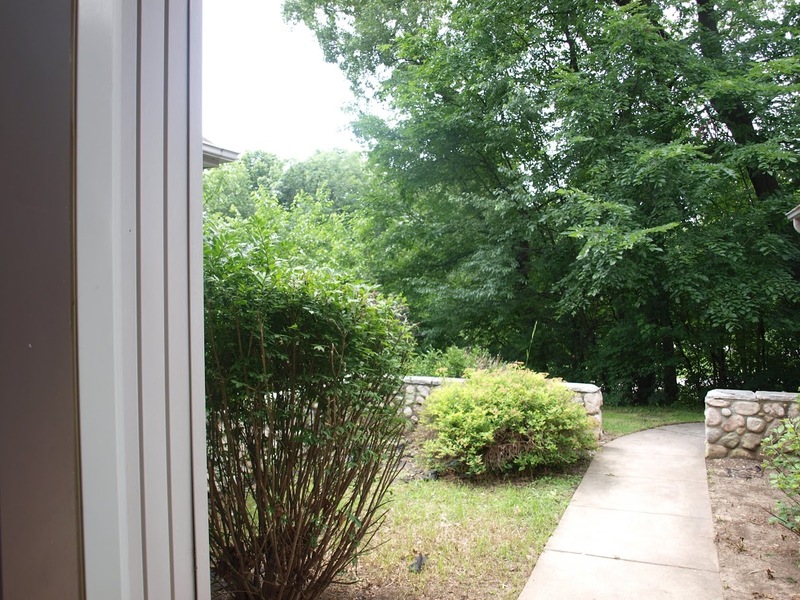 Clearing away all the overgrown straggly bushes and weeds made way for a peaceful, pea gravel courtyard you can see RIGHT HERE. 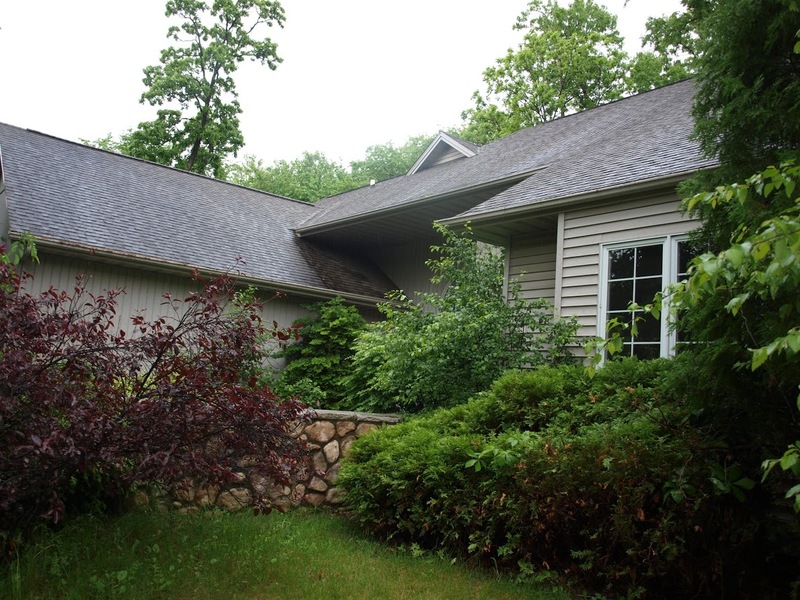 The siding on the house is light stone grey. I went for a tonal look for preowned outdoor furniture purchased from a friend, painting it a 50/50 mix of FARROW & BALL Cornforth White and Hardwick White. AFTER. Find similar wood patio benches RIGHT HERE. 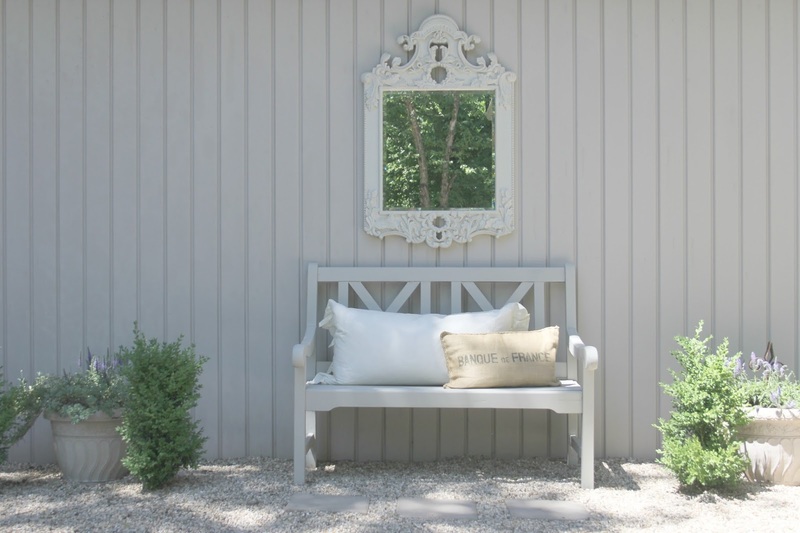 Find a pretty French inspired mirror RIGHT HERE. Pillows: Grandin Road and RH. Find a white lumbar pillow with ruffle HERE. Before & After: European Country Style Fixer Upper…photos of our cottage renovation as well as shopping resources to get the look. French Nordic cottage style and European farmhouse decor ideas…certainly lovely indeed. AFTER. Hello Lovely Studio. Find industrial French metal bistro chairs HERE. Slate Rubber Planter boxes are HERE. Custom grainsack pillow: FROM THIS SHOP. Front door: FIND HERE. Before & After: European Country Style Fixer Upper…photos of our cottage renovation as well as shopping resources to get the look. French Nordic cottage style and European farmhouse decor ideas…certainly lovely indeed. Replacing the front door was actually not a priority since I knew just painting the existing steel door could make a big difference. 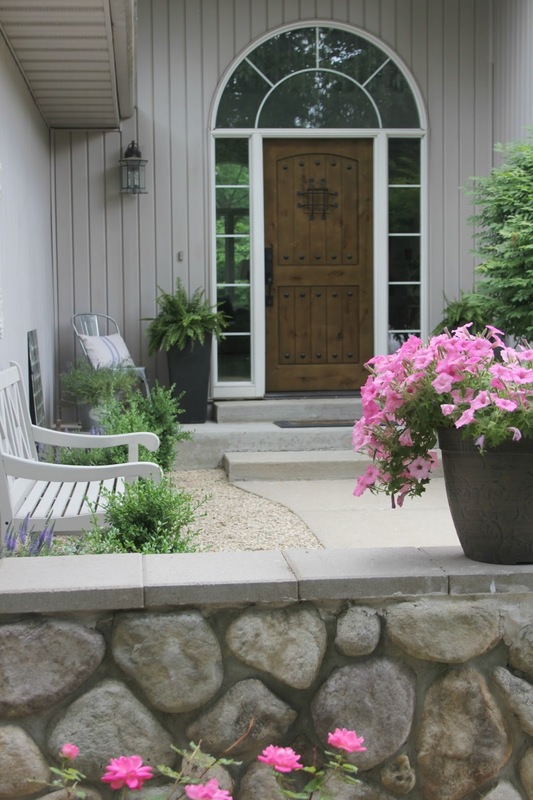 It was after we worked with Pacific Entries to replace most of the hollow core interior doors with solid, rustic alder planked doors that we realized we could transform both the interior entry and exterior porch in one fell swoop! We still haven’t upgraded the exterior lighting at our home, but what a huge difference. 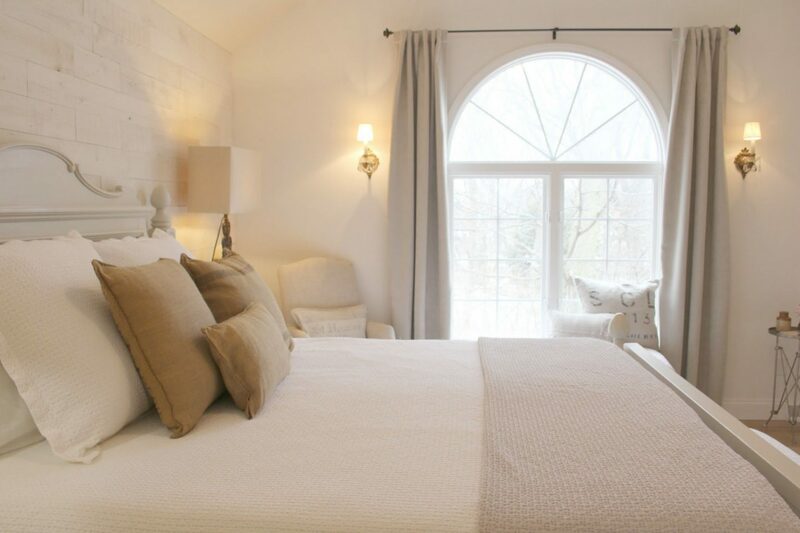 We love giving this place an identity with French Nordic cottage and European country farmhouse style. AFTER. Hello Lovely Studio. Front door: Rustic Alder Exterior Door With Speakeasy. 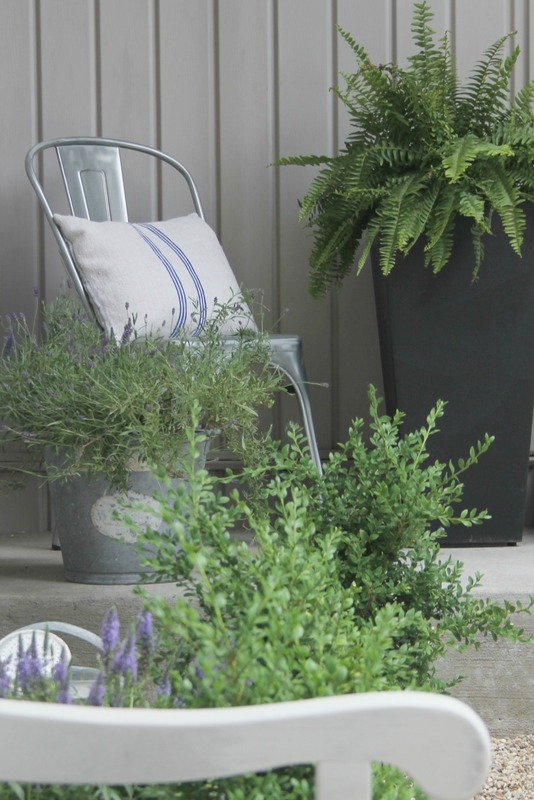 Find vintage galvanized watering cans RIGHT HERE.Before & After: European Country Style Fixer Upper…photos of our cottage renovation as well as shopping resources to get the look. French Nordic cottage style and European farmhouse decor ideas…certainly lovely indeed. 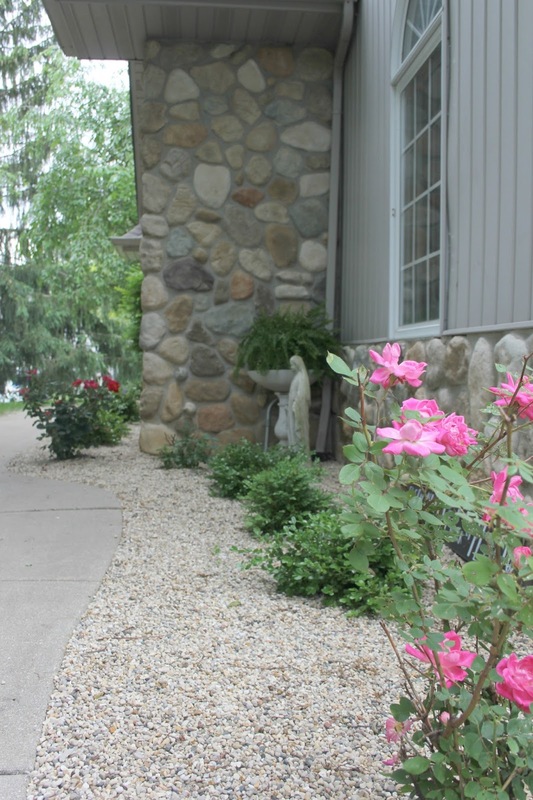 Eventually, we would like the river rock walls topped with a natural stone, but since the tops we inherited the place were eroded and nasty looking, my idea was to remove the old top and replace with low cost concrete as a temporary solution. For under $40 (the concrete pavers were under a dollar each from Home Depot), this solution has served us well even 4 years later. AFTER. Hello Lovely Studio. FIND HERE candles that repel mosquitoes (which are legendary in these parts). Pillows: RH. Find a burlap lumbar pillow at a great price RIGHT HERE. AFTER. We did all of the landscaping ourselves, and we are NOT gardeners so it’s super airy and simple with boxwood and a few knockout roses. I found the statue of Mary at a local estate sale and spent about 4 hours talking to its previous owner…there is nothing like collecting stories along with the objects of your desire. I’m not exaggerating when I say the tile near the front door was the exact color of an awful bruise. It was sort of fitting since the whole house had been beaten up. We still haven’t upgraded the bifold closet doors which I despise, but things look a lot better! AFTER. Hello Lovely Studio. 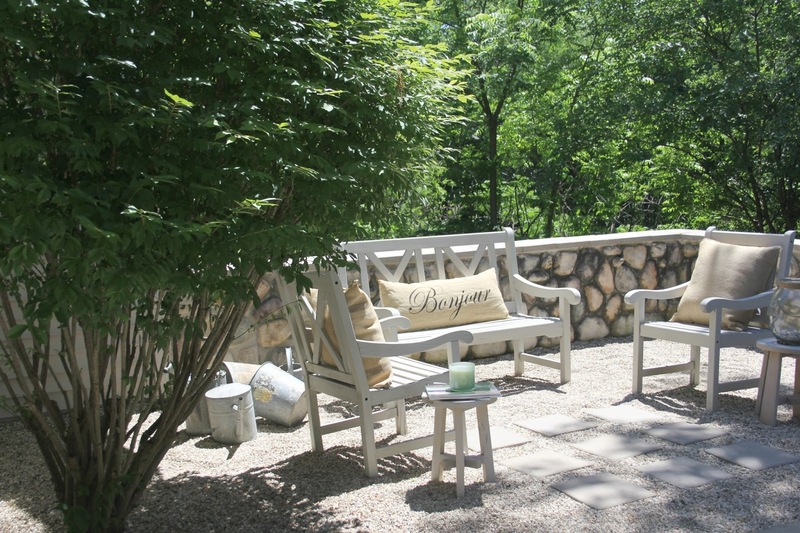 I collect these vintage French prayer chairs and they find me wherever I roam…really! Wall paint color: BENJAMIN MOORE White. 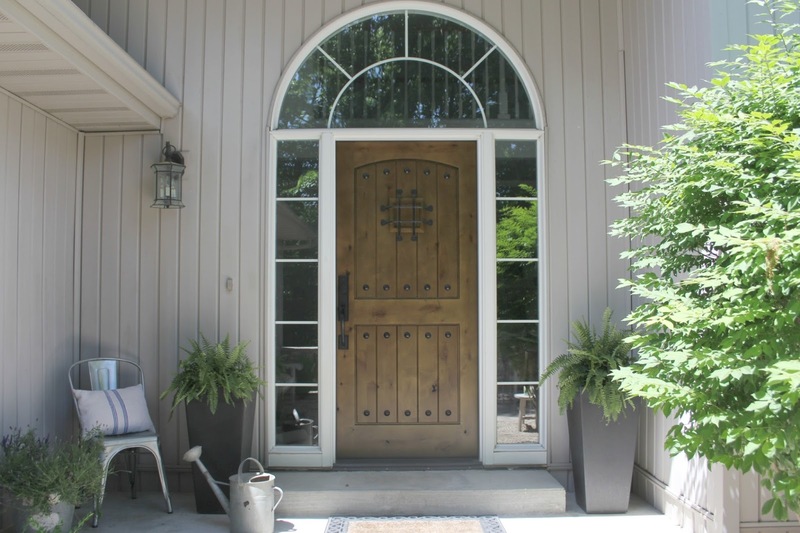 Rustic alder exterior door with speakeasy: FIND HERE. Jute rug: FIND HERE. Before & After: European Country Style Fixer Upper…photos of our cottage renovation as well as shopping resources to get the look. French Nordic cottage style and European farmhouse decor ideas…certainly lovely indeed. The stairs were the open riser type which I associate with the Brady Bunch, and they can be sort of charming in the right project and when they are wood rather than wrapped in cheap carpet. We needed a budget friendly fix! 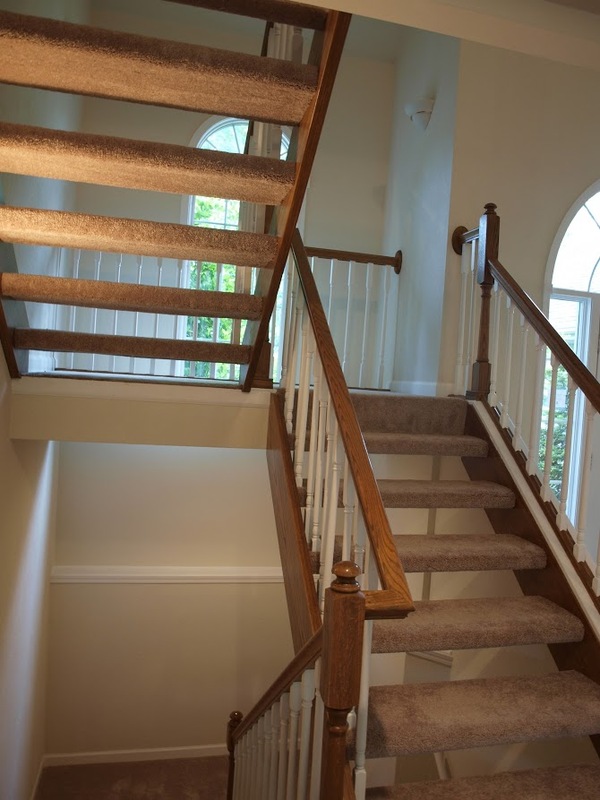 We closed the risers, installed a linen-hued durable carpet, and painted everything white except for the handrail. I sanded most of the existing stain and varnish from the rail and then rubbed on a clear wax. AFTER. Hello Lovely Studio. 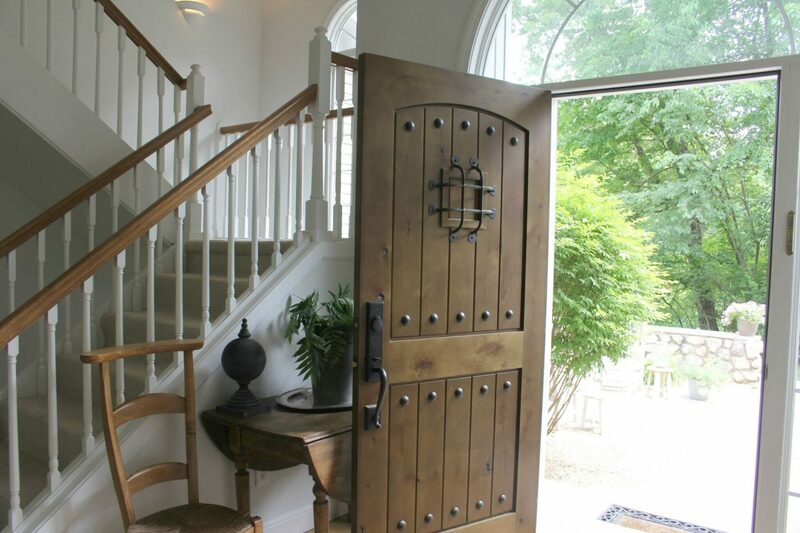 I love the beautiful Southern exposure and daylight flowing into the entry and stairway. Wall paint color: BENJAMIN MOORE White. Rustic alder door with speakeasy: FIND HERE. Before & After: European Country Style Fixer Upper…photos of our cottage renovation as well as shopping resources to get the look. French Nordic cottage style and European farmhouse decor ideas…certainly lovely indeed. 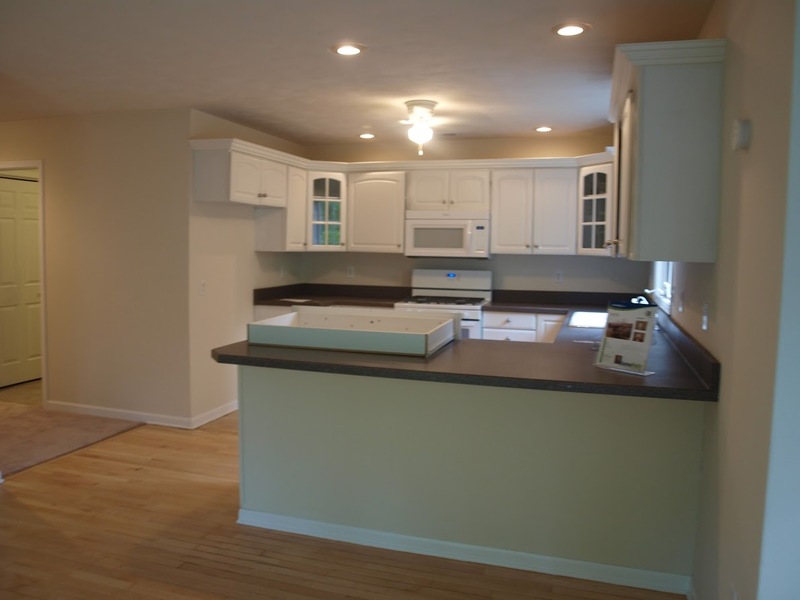 The marketing photos of the kitchen in the house didn’t look horrible since they showed off the natural maple hardwood floors and white cabinets. Except you can’t tell from photos that the wood floor had been destroyed from water underneath and that the vinyl cabinets were worn out and well past their prime! 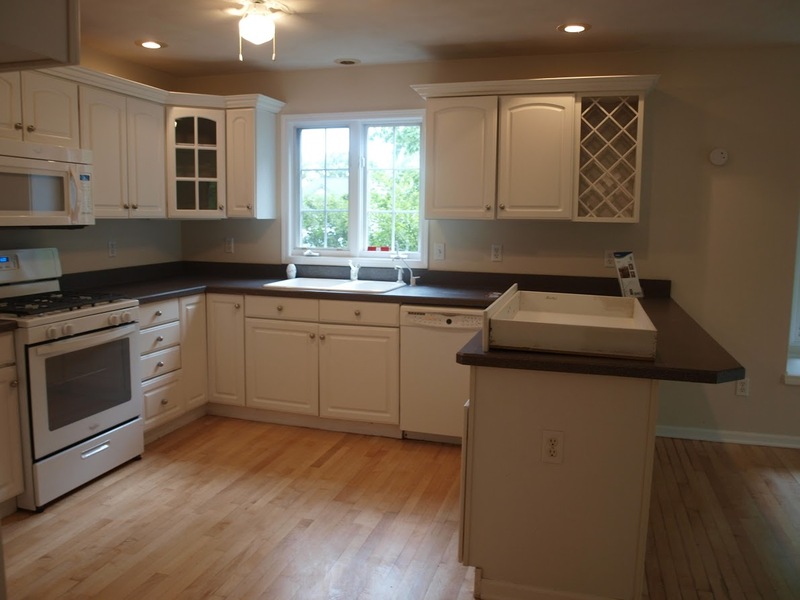 The countertops were new navy blue laminate, the sink was a new white cast iron model, and white range and microwave were brand new. We salvaged the cabinetry we could and moved it with the countertop into a basement workshop. 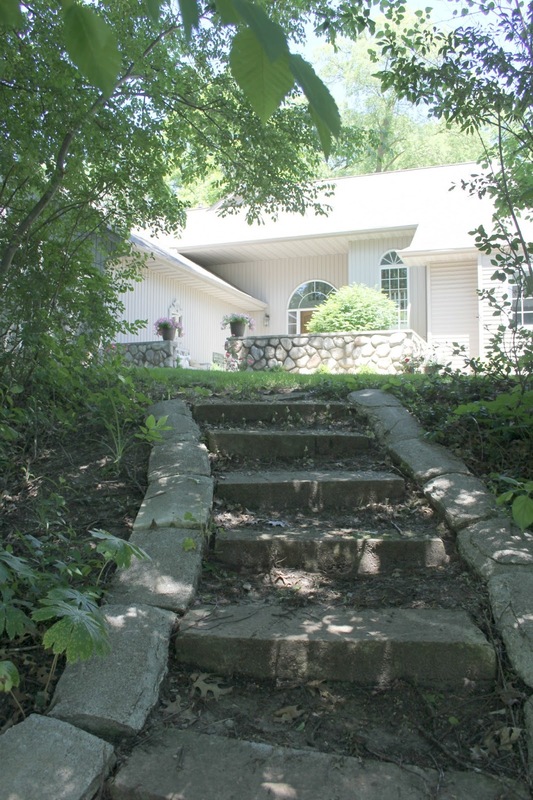 Every single thing we could re-purpose in this fixer upper was incorporated into the plan. AFTER. Hello Lovely Studio. Sink: find similar HERE. Kohler Bridge Faucet: RIGHT HERE. Wall ovens: Bosch. Before & After: European Country Style Fixer Upper…photos of our cottage renovation as well as shopping resources to get the look. French Nordic cottage style and European farmhouse decor ideas…certainly lovely indeed. As is often the case, things got far worse in the kitchen before they began to get pretty! Here’s the breakfast dining area of the kitchen before we were forced to demo the flooring (no worries – we salvaged the usable boards!) and redo almost everything except the window seat. AFTER. Hello Lovely Studio. 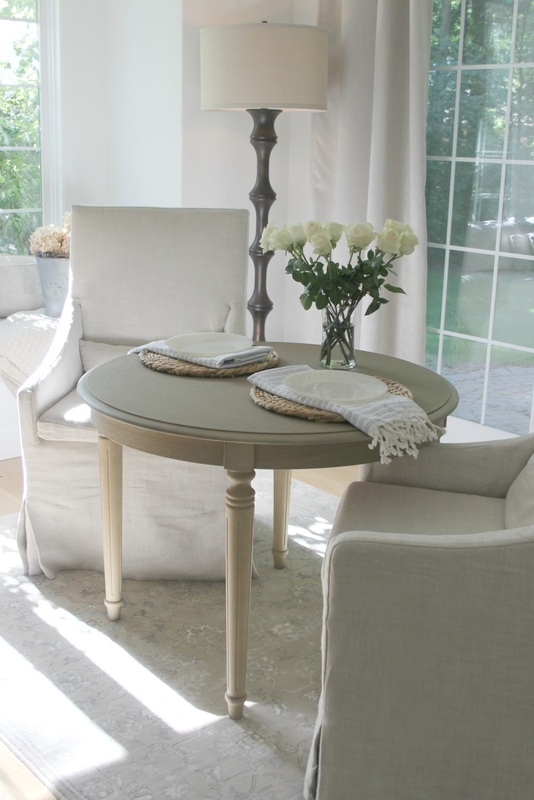 Table, dining chairs, throw, and pillows: RH. Rug: Homegoods. Wall paint color: BENJAMIN MOORE White. AFTER. Hello Lovely Studio. Stripe Turkish Hand Towels RIGHT HERE. Before & After: European Country Style Fixer Upper…photos of our cottage renovation as well as shopping resources to get the look. French Nordic cottage style and European farmhouse decor ideas…certainly lovely indeed. Wall paint color: BENJAMIN MOORE White. Care to see how things got worse? And just so you don’t think I’m making it up that the whole house was painted an awful antique white…look at the contrast of old vs new BENJAMIN MOORE White I painted the whole house. AFTER. Hello Lovely Studio. 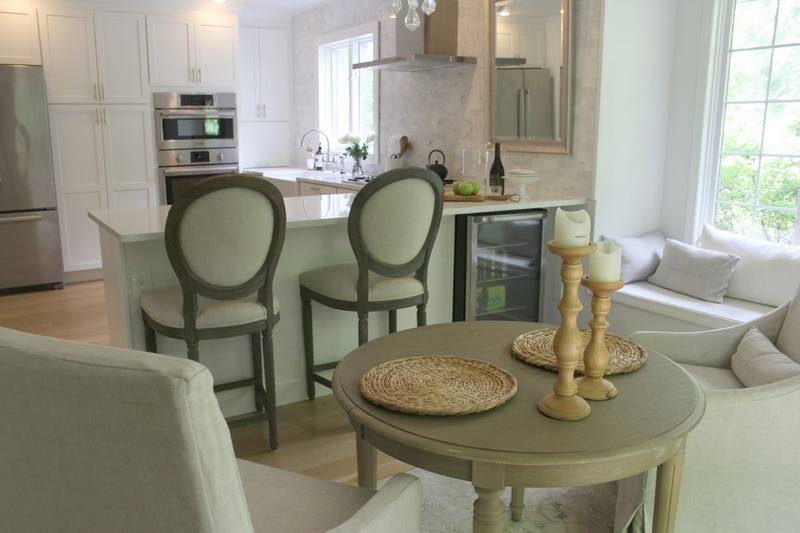 Louis style counter stools: FIND HERE. Wall paint color: BENJAMIN MOORE White. AFTER. Hello Lovely Studio. Before & After: European Country Style Fixer Upper…photos of our cottage renovation as well as shopping resources to get the look. French Nordic cottage style and European farmhouse decor ideas…certainly lovely indeed. Wall paint color: BENJAMIN MOORE White. 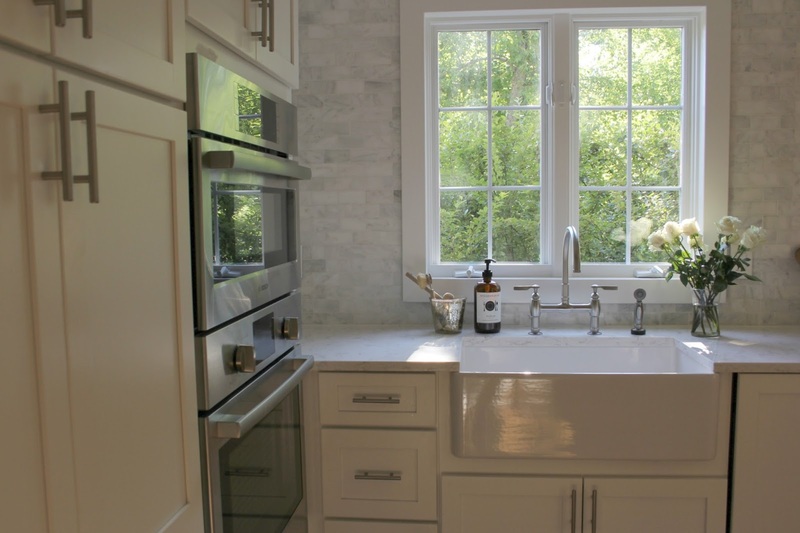 In the old kitchen design, upper cabinets flanked the window over the sink and felt so boxy and claustrophobic for me. The ceiling fan was old, loud, wobbly, and ridiculous. AFTER. Hello Lovely Studio. Beverage frig under breakfast bar: FIND HERE. The step back cabinets to the right of the ovens (above) contain a cool appliance garage (on a hinge which lifts straight up) so I can hide away my toaster and blender. AFTER. Hello Lovely Studio. Cooktop: Bosch. 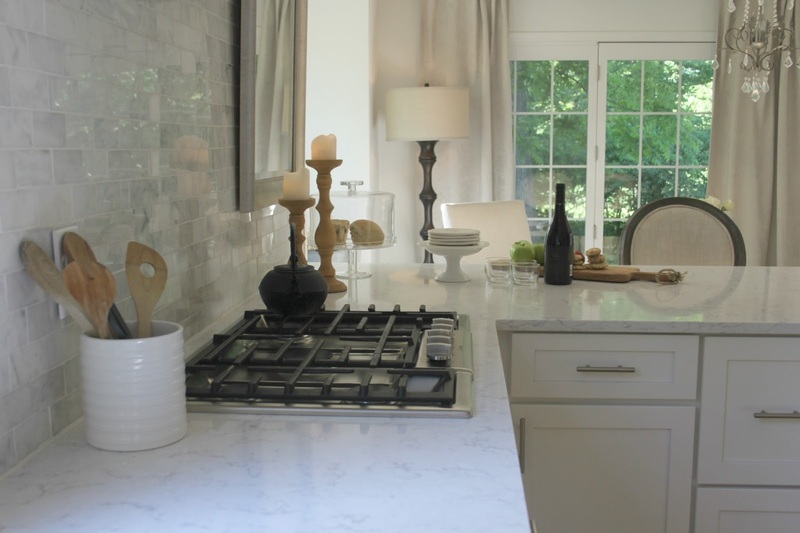 Countertop: Viatera quartz (Minuet). This was my first cooktop (see above), and while it functions well, I kind of miss having a range, mainly because I love the look of a traditional style kitchen. AFTER. Hello Lovely Studio. Wall paint color: BENJAMIN MOORE White. In the kitchen’s U-shaped design before, the refrigerator was located across from the sink wall. I chose a French Door Frig and moved it to the corner, adding horizontally installed wood beadboard (and no cabinets, hooks, or any clutter) to the former frig wall. (And yes, when we viewed the house, they didn’t even bother repairing an old broken kitchen drawer which was just plopped down on the breakfast bar. A simple but smart addition to the breakfast bar: horizontal installed solid wood beadboard which I painted white. It takes all sorts of abuse and wipes clean far better than drywall! AFTER. Hello Lovely Studio. Counterstools: FIND HERE. Large seascape: Melissa James Studio. Wall ovens & Refrigerator: Bosch. Countertop: Viatera quartz (Minuet). 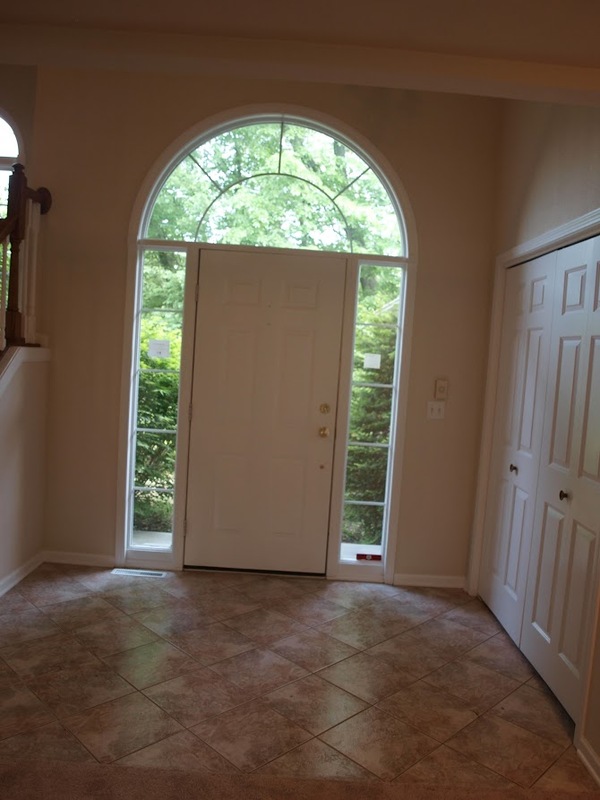 Before & After: European Country Style Fixer Upper…photos of our cottage renovation as well as shopping resources to get the look. French Nordic cottage style and European farmhouse decor ideas…certainly lovely indeed. 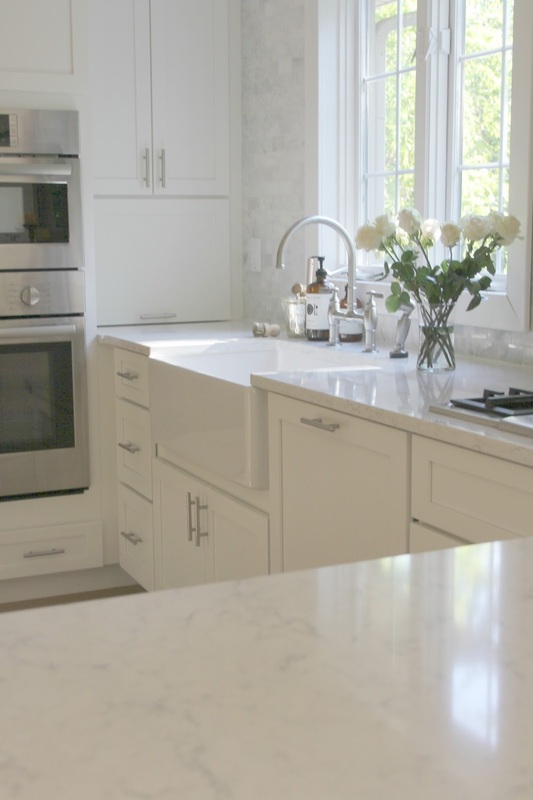 You can read about my journey to find the right white countertop RIGHT HERE. And just so you’re aware, I didn’t use any sponsors on any of this kitchen renovation so you don’t have to wonder whether I’m pushing a particular appliance or surface in here. We spent a ton of money even with doing the work ourselves! AFTER. Hello Lovely Studio. Sink: FIND SIMILAR HERE. Faucet: RIGHT HERE. Ovens: Bosch. Countertop: Viatera quartz (Minuet). The mirror was hung just a placeholder since we wanted floating shelves which are still all the rage with the cool kids in their modern farmhouse obsession. Still no shelves, and I’m okay with it. AFTER. Hello Lovely Studio. Abstract paintings reflected in mirror by me. Cabinetry: Schuler. Cabinet hardware: RIGHT HERE. Cooktop: Bosch. Countertop: Viatera quartz (Minuet). Teapot: FIND HERE. Candleholders: FIND HERE. Range hood: FIND HERE. Can you believe how dark this kitchen felt? It needed love! AFTER. Hello Lovely Studio. 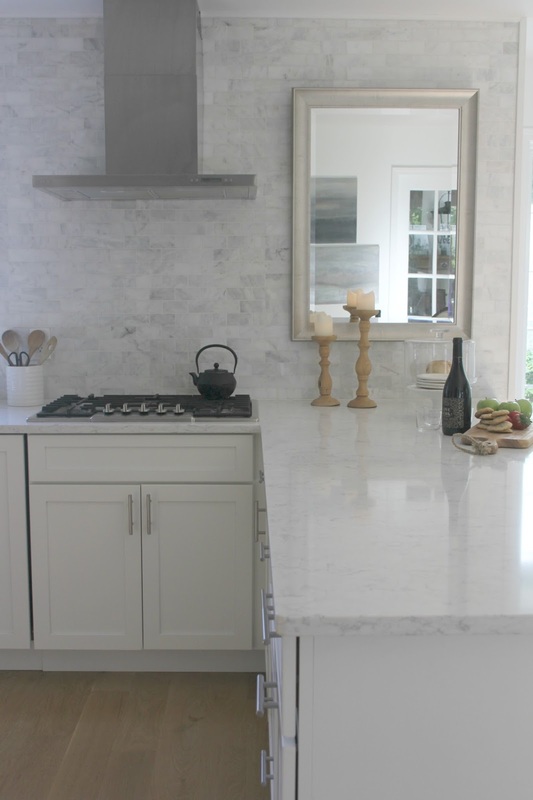 Countertop: Viatera quartz (Minuet). 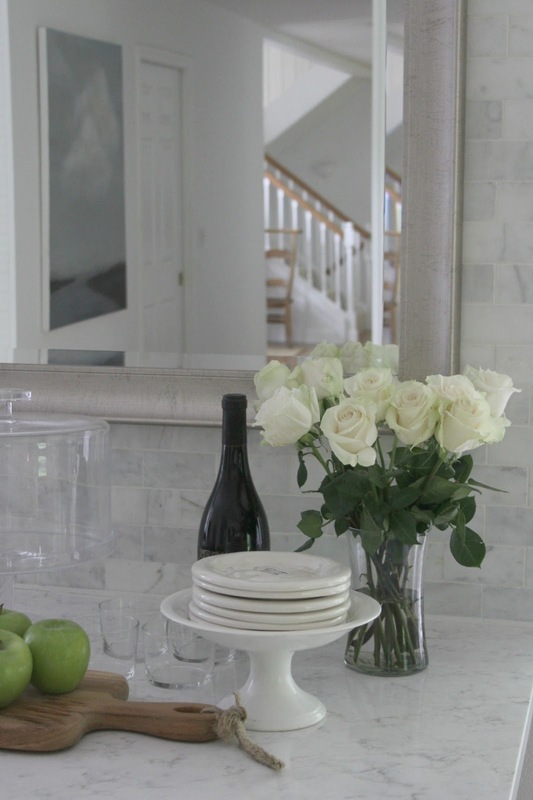 Find polished marble subway mosaic tile RIGHT HERE. Before & After: European Country Style Fixer Upper…photos of our cottage renovation as well as shopping resources to get the look. French Nordic cottage style and European farmhouse decor ideas…certainly lovely indeed. Hope you enjoyed this before and after! My next post RIGHT HERE continues the tour of our fixer upper’s great room and master bedroom. Take it for a whirl too! Hello Lovely Studio. Toilet on the catwalk…renovation reality, folks! See the before & after of the bedroom soon! Hello Lovely Studio. Wall paint color: BENJAMIN MOORE White. DON’T MISS Part 2 RIGHT HERE. For more French Nordic inspiration, do visit THIS and THIS. 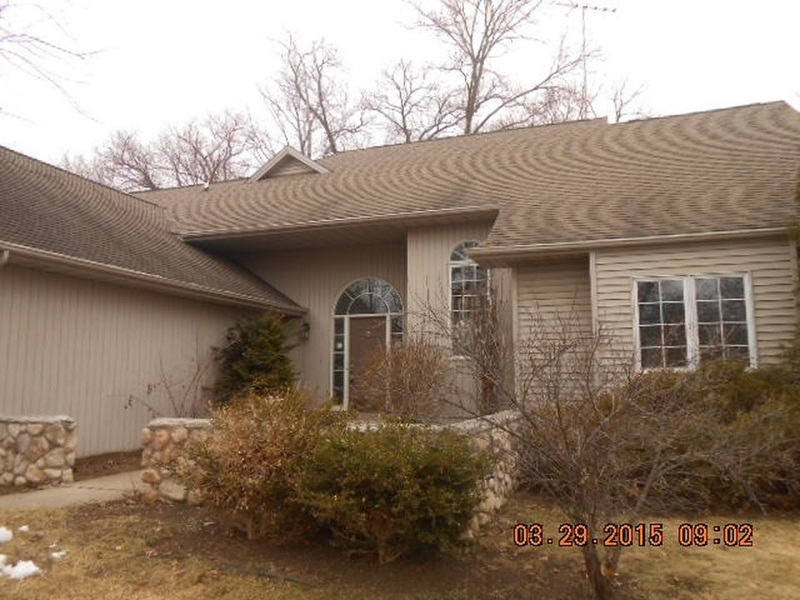 Your home is a beautiful transformation, Michele. Lots of hard work but I’m sure very rewarding. I love the peaceful and tranquil feeling your decor creates. Your home is beautiful. Love your kitchen. Can’t wait to see your master bedroom. We are in the process of giving our laundry room a face lift. 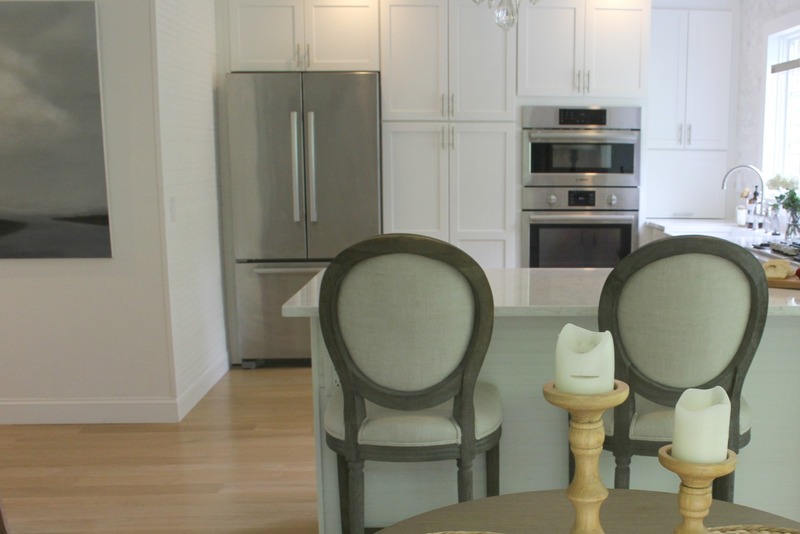 I will be shopping for Benjamin Moore white paint today! We are planning a kitchen remodel, and your stunning transformation has inspired me for some time. Our design currently places the fridge (likely a french door model similar to yours) right next to a solid wall. I was concerned about being able to open the door on the wall side enough with that design. Do you know how far you needed (inches?) to be from the wall to make this work well? Are you happy with that layout? We would also have the dishwasher between the sink and the range and was wondering if that was “enough” space for separation of each zone. Thank you for all the beautiful inspiration in your posts! Your house looks beautiful. I have read a lot about how difficult it is to choose white paint based on where you live and whether the exposure is facing north. 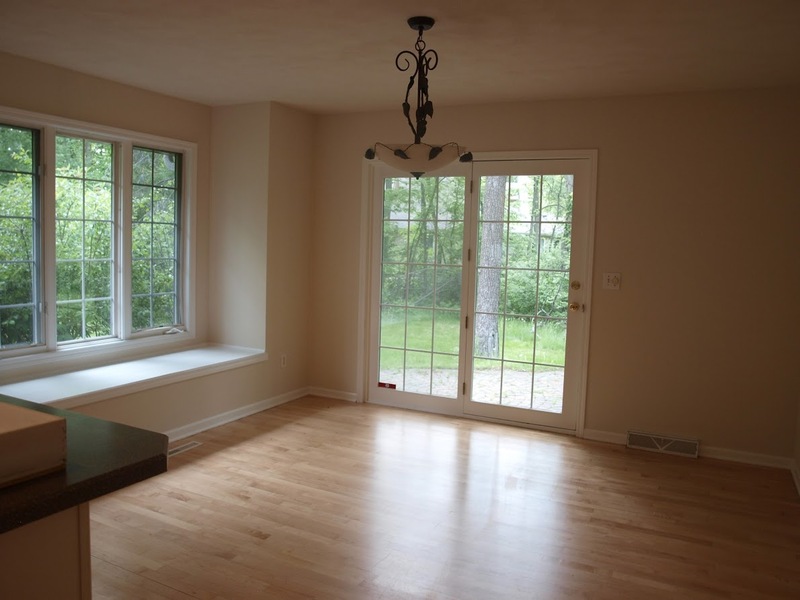 My kitchen and living area only have light coming from North facing windows so I am cautiously looking at whites. Did you have any difficulties with some of your walls looking cold or too blue? I would also like to know what the finish is on the mirror hanging over the breakfast bar? It looks great with the wall tile. thank you. Always love a good before and after! 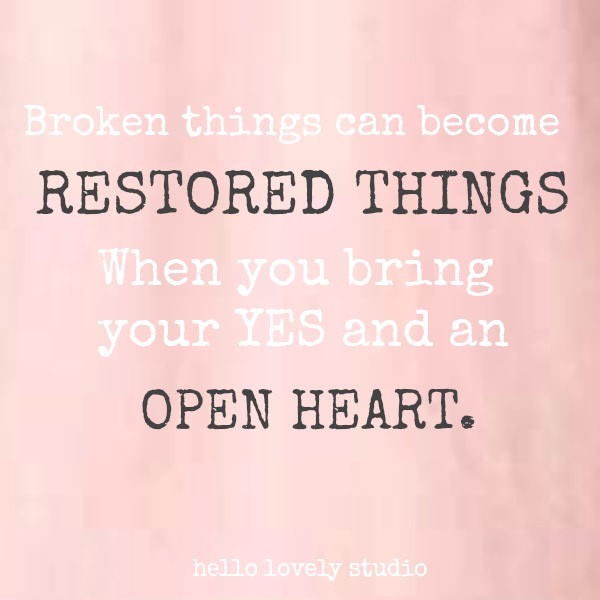 Thank you for sharing at Homestyle Gathering! Hope to see you each week! Thanks for sharing at Thursday Favorite Things. You did an amazing job of transforming your home. It is so beautiful. I know what you mean by slowing down as we get older. Not so many major projects as when we were younger. Take time to enjoy your lovely home. Great advice! Thanks so much for your kindness and for reading. I’m just letting you know that your before and afters are one of my features this week at Homestyle Gathering. Thank you for joining us and linking-up! I hope you’ll join us again! Thank you so much, Kim! Yay! I will be joining you for sure! Such an amazing transformation, Michele! 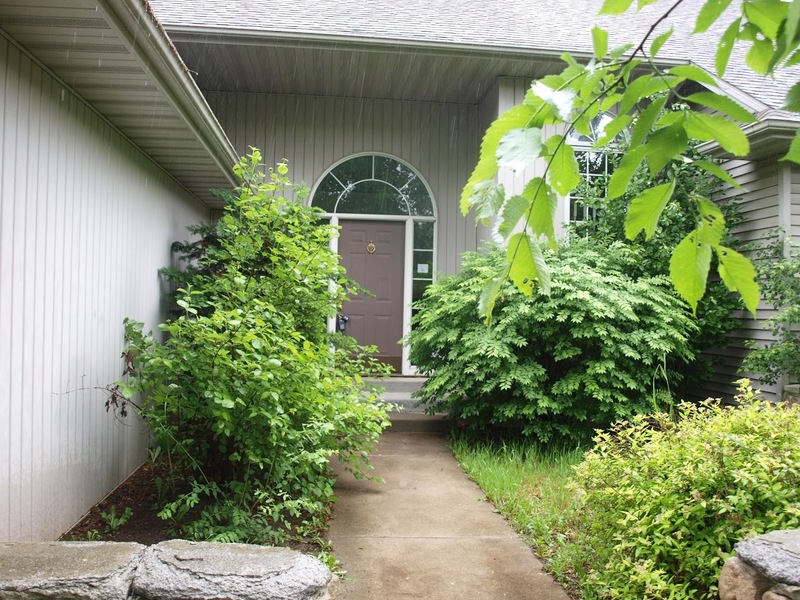 I love everything you did, and that front door is amazing. 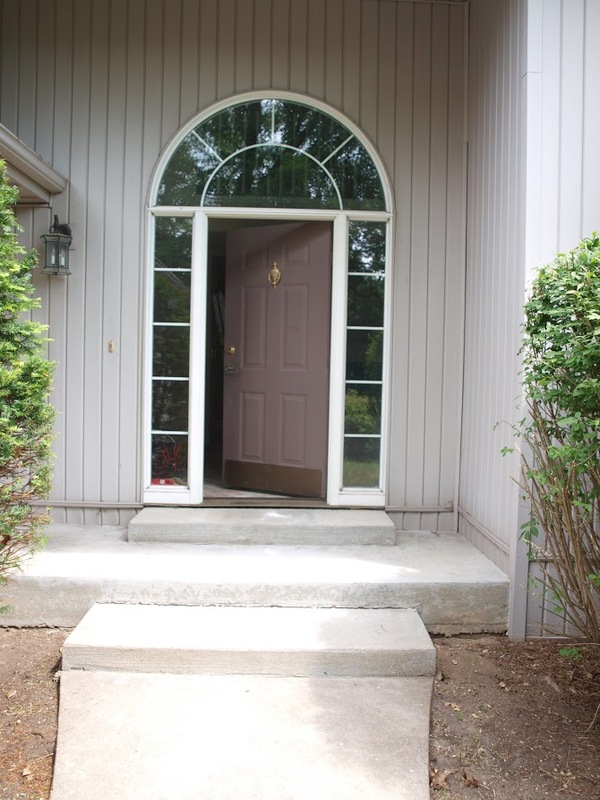 We are in need of a new front door, and my choice would be that one! Thanks so much for sharing it with us at Thursday Favorite Things — I’m featuring it today!